(York, Pa., April 4, 2018) - The York Revolution have signed three more players to their 2018 roster, bringing in left-handed pitcher Robert Carson, returning right-handed pitcher Jacob Ezell, and catcher/infielder Chris Rivera. The signings were unveiled by manager Mark Mason live on Tuesday night’s episode of “Revs Hot Stove Weekly presented by Shipley Energy” on SportsRadio 1350 WOYK. Carson is a familiar name as he’s spent the last three seasons pitching in the Atlantic League. The veteran southpaw pitched in 58 games (one start) for the Southern Maryland Blue Crabs in 2017, going 3-4 with a 3.79 ERA. He has 38 strikeouts and 18 walks in 57.0 innings of work and logged eight straight scoreless appearances to end the season. Carson started the 2016 season with the Bridgeport Bluefish before being traded to Southern Maryland on June 1, and in 2015 he went 7-3 with a 2.88 ERA for the Bluefish. Prior to pitching in the Atlantic League, he made a combined 31 appearances in the Major Leagues for the Mets in 2012 and 2013. He has also spent time in the Angels’ organization. Carson was drafted by the Mets in the 14th round of the 2007 MLB Draft and is a native of Hattiesburg, Mississippi. 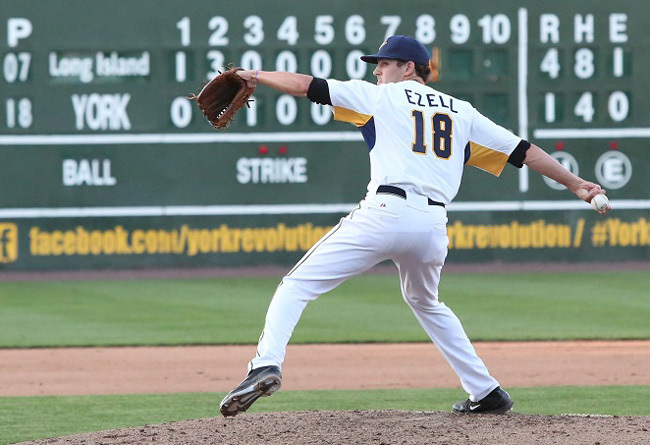 Ezell returns to York after pitching in nine games (one start) for the Revs last season. The young right-hander went 0-1 with a 3.78 ERA over 16.2 innings with 10 strikeouts and seven walks. Ezell made the Revs’ postseason roster and pitched in one game during the team’s championship run. He joined the Revs after starting the season with the Traverse City Beach Bums of the Frontier League. In 2016, he pitched 41.2 innings in 23 games for the Utica Unicorns in the United Shore Professional Baseball League, and he spent the 2015 season in the Frontier League with the Florence Freedom, who originally signed him to start his pro career, and the Windy City Thunderbolts. Ezell played his college ball at Columbus State University. Rivera comes into training camp with the opportunity to provide stability at multiple positions, as he’s spent significant time at catcher, shortstop, third base, and second base in his past professional seasons. The 23-year-old didn’t play during the 2017 season but played at three different levels in the Cardinals’ minor league system in 2016, being promoted as high as Triple-A Memphis. Rivera spent most of that season at High-A Palm Beach, where he had two home runs and 13 RBI in 33 games and played all of his games at catcher. Now a utility man, Rivera was originally drafted as a middle infielder by the Cardinals in the 7th round of the 2013 MLB draft. “He is a player that is unique in a lot of ways. Flexibility is something we talk about all the time, versatility. To be drafted as a shortstop and then make it to Triple-A as a catcher in addition to that, I think that says a lot defensively about the type of player he is. I know he’s excited about coming in. I’m excited to see what he can do. To have a guy that can catch and play other positions, that’s a big help for us,” Mason said. The Revs now have 27 players under contract for the 2018 season and will unveil additional signings on the final episode of “Revs Hot Stove Weekly presented by Shipley Energy” on Tuesday, April 10, at 6 p.m. on SportsRadio 1350 WOYK and www.woyk1350.com.